During this week-long sewing camp, we will make all sorts of colorful projects such as a unicorn pillow, rainbow e-reader sleeve, hand embroidery art, pom pom garland, and a rainbow blanket. 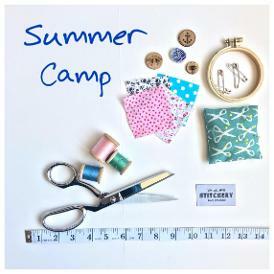 This summer we will create wardrobe items using the Fashion Kit series of patterns which uses an innovative online interactive set of instructions. During the week we will make a pair of leggings, a gathered skirt with a zipper and button closure, handbag, and many accessories to go with the new outfit. We will close the week with our annual fashion show on Friday! Sew clothing and accessories for you and your American Girl Doll with all new designs. Projects include dresses, a sleeping bag, poncho and even a sunhat. Create wardrobe items using the Fashion Kit series of patterns which uses an innovative online interactive set of instructions. During the week we will make a sundress, cross body bag, and accessories to go with your new outfit. Recommended for ages 11 and older. During this nautical-themed week, we will make a stuffed mermaid doll and many accessories to go with her such as a removable tail, skirt, blanket and some sea creature friends. All materials are included, snack and drink will be provided each day (if your child has specific dietary requirements, please provide a snack). Before and after care is not available, so please arrive no earlier than 10 minutes prior to 9am and promptly pick up by 12:15pm.